Home » Tech » Laptop » The best laptop ever – Period! The best laptop ever – Period! For the 2nd time in less than one year I have been scouting out the market for laptops. Not that I need a 2nd laptop really. It’s just that laptops today aren’t made for being left open outside in pouring rain. Yeah, that’s me in a nutshell. I bought my Toshiba Satellite 530 back in march and I haven’t been quite as satisfied with it as I was with my previous Toshiba. I think they have compromised on the quality. I didn’t like the keyboard and the lid/monitor part was a bit flimsy. I had heard about the notebooks from Lenovo and I decided to see what they were all about. Lenovo is the company who today is selling the notebooks from IBM. I believe IBM still takes care of the support for the notebooks. I went to Lenovo’s website to check out their Thinkpad Notebooks. Thinkpad notebooks have a nice black and straight business look to them and that’s fine with me. I don’t like the “metal and tons of buttons” kind of look anymore. That is soo 2006. I was looking for a lot of power in my new notebook and I wanted a 15.4 widescreen monitor so I found that the Thinkpad T-series would fit my needs. 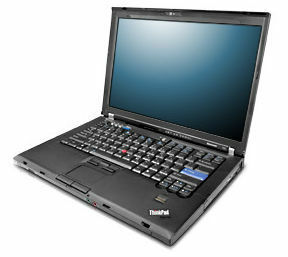 The proper name for the T Series notebooks are either T61 or T61p. I believe the only difference between those two models is the size of the graphic card, so if you aren’t a gamer then T61 should be sufficient for you. They also have a less expensive R-series, but that comes with smaller processors and does not have the 15.4 widescreen monitor. On Lenovo’s website you can customize your own notebook configuration and that’s pretty cool. You choose the parts that fit your needs best and they put the notebook together as ordered and ship it to you. No off the shelf products here. I went ahead and started customizing my notebook on their website. It’s a fun and simple process and it might require some research from you if you aren’t familiar with all the computer parts involved. They do provide suggestion and help during the process. First you have to choose if you want the integrated video card Intel GMA X3100 GM965 or if your want a NVIDIA graphic card. I went with the NVIDIA and continued the customizing. I choose the 2.2 GHZ Intel Core 2 duo T7500, which was listed as a popular upgrade among other customers. It should be sufficient power for my use. For my system software I choose Windows Vista Home Premium. I had the option of XP for a small $22.50 addition to the price, but I actually like Vista now. It’s easy to work with. I picked a total of 2GB memory and I upgraded the hard drive to 100GB, 7200 rpm. I also upgraded to a dual layer recordable DVD for another $75 to the total. I went with the standard Intel Pro wireless card, but added Bluetooth so I can use a wireless Bluetooth mouse when I’m working at home. I had to upgrade the battery. I ordered a 9 cell battery which should give me a whopping 6+ hours without charging! It got to be the longest any laptop can run on a charge. I am aware that the battery will stick out about one inch on the back of the notebook, but I have no problems with that at all. Finally I upgraded the original 1 year warranty to 3 years. I want to make sure I’m covered well. Now my total showed up as $1953, but because they had a special going the price was $1494. Now that’s a lot of money for a poor student and this was where I almost left the site. I decided to browse their site to see if they had any cheaper options, and that is when I discovered their Rebate Center. They had a $100 mail-in rebate offer and combined with the “Buy Now, Pay Later” option, it was actually possible for me to buy my IBM Thinkpad Notebook. The notebook arrived about 3 weeks later. Yes, it’s a long time but I can guarantee you it’s worth the wait! That notebook is so nice and sturdy. You see it and feel it as soon as you get it in your hands. There are a couple of nice features I didn’t know about when I ordered it: It has a red rubber dot in middle of the keyboard (track point) that works like a mouse. You control it with the tip of your finger. It also has night light! At the top of the monitor frame there is a small light down over the keyboard, so you can use the laptop even though the room you are in is pitch dark. It’s probably great when you are flying at night or if you are using it while being passenger in a car. I did a clean Windows Vista install to get rid of the trial software there was installed and I am very happy for my new laptop!